Hey lovely ladies! Today we're up to John 18 in our Jesus 101 series and we're nearing the end of the book of John. Today we read about Jesus's arrest - and as you probably already know, this is the beginning of the end of Jesus's time on earth. Jesus has been betrayed by one of His very own disciples, Judas, and soldiers and officials have arrived to arrest Jesus. I want you to put yourself in Jesus's shoes for a second.... If people came to arrest you and take you away and you knew you were guilty of a crime, you'd feel pretty humiliated - wouldn't you? But now think about how you'd feel if you were innocent. I think you'd be pretty devastated and angry. For us, this would have been an incredibly demeaning and anger provoking experience - we would have said some nasty words, lashed around in anger and there probably would be hundreds of tears shed - but Jesus isn't like us. Here we once again see Jesus's majesty and glory. During this time which was filled with attack, betrayal and abandonment, Jesus demonstrated His confident trust in the Father. Jesus knew that this was all part of the plan - and He trusted in God every step of the way. Jesus trusted God in a situation where we would most likely have given up. We'd probably go straight to thinking all hope was lost. That was it, we were goners - but Jesus's calm assurance should help us face life's hurts and injustices with the same trust in God. Jesus knew that His hour had come - He positioned Himself to be arrested as He took His disciples across the Kidron Valley because He knew that's where Judas would be waiting. Judas expected Jesus to be there and Jesus delivered. Jesus was not caught off guard - and He wasn't at all surprised by Judas's deception. He knew exactly what was happening and submitted Himself fully to the Father's will. Jesus had prepared Himself through prayer - and that's an important lesson to learn from these last few chapters. Jesus didn't neglect His true source of strength - He was ready for this test when it arrived because He had strengthened Himself through prayer. Jesus showed that authority and power in John 18:5-6. We see Him knock the crowd to the ground only with His words. Jesus says I am He and they fall back. John tells us this so that we will know beyond any doubt that Jesus was in control of the situation. No man took His life. Jesus laid His life down willingly as a sacrifice for all of us. Jesus, the Son of God chose to die so that we might be forgiven. He chose the cross so that we could have a relationship with the Father. He died so that our debts could be wiped clean. Jesus laid down His life for us out of His love for us, knowing full well that we may never love Him in return. He truly is the good shepherd because He put our welfare above His own and took the blow on our behalf. I often hear people say "If God just showed His power, surely everyone would repent and turn to Him" - and whilst that might be the case for some, it's certainly not the case for all. God's demonstration of power does not guarantee repentance because repentance is a choice. 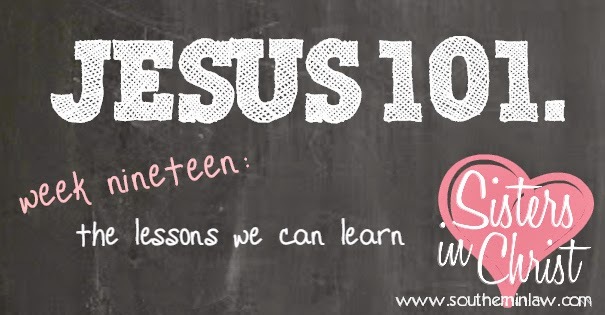 We also have a lesson to learn from what Peter does in John 18:10. We see Peter cut the ear off Malchus (one of the high priest's servants). Here Peter was trying to help Jesus - but in the end, whilst his intentions were right, he actually did more harm than good. Peter went about doing something good in the wrong way. But whilst you or I may not have cut off a sinner's ear (well, at least I hope not! ), we may have gone about doing something good in the wrong way too. Have you ever approached someone or responded to them in a way that actually made it harder for them to hear the gospel than before they met you? Think about it: you may have treated someone badly or given them a bad impression of "Christians" through your actions - or you might have been selfish and not wanted them to hear the gospel because church was "your thing" - or perhaps you were just too embarrassed to open up. We've all done at least one thing that might have put up a road block - even if that was never our intention. Jesus always has to come behind us to correct the mistake. But how do we stop ourselves from making those mistakes? Let's use Peter's experience as a way of finding that solution. Instead of praying, Peter was sleeping alongside the other disciples. Peter failed to prepare himself for the challenges he would face - like the five foolish virgins that we hear about in Matthew 25 who think that they can leave everything to the last minute and be okay. But like those five virgins who didn't know when the bridegroom would arrived (and thus missed his arrival as they were too busy doing what they should have done beforehand), we don't know when we're going to need our spiritual armour. We need to put on that spiritual armour before the evil day arrives. We need to be prepared - and not become idle during the wait - just like how we need to be preparing ourselves for the return of Jesus as we never know when that day will arrive. In 2 Corinthians 4:10 we're reminded by Paul that "The weapons we fight with are not the weapons of the world. On the contrary, they have the divine power to demolish strongholds". We may be trying to solve a problem through physical means when a spiritual approach could yield better results. Take the time out to pray for a solution and an answer. Peter was expending all of his energy dealing with a secondary cause rather than looking at the Father's will and cooperating with it. When we find ourselves vigorously hacking away at something to solve a problem and getting unsatisfactory results, we need to turn to God and pray as Jesus prayed until we can see what it is God is doing in our lives and how He wants us to respond. Throughout John 18, John wants to make one thing very clear to us; Jesus was not taken against His will. He willingly offered himself as a sacrifice for sin. We should also realise this; If Jesus was in control during those darkest hours, you have to know that He is in control of whatever may be going on in our lives. Things may seem like they're out of control to us, we can trust that Jesus has full control. In this story we are assured of Jesus's control over the events and circumstances of our lives and we can find the courage to trust Him even when we don't understand all that is happening. We see Jesus fully in control of His destiny. We see Him full of majesty and authority even whilst being arrested as a common criminal. Jesus was in charge - and He's still in charge today.